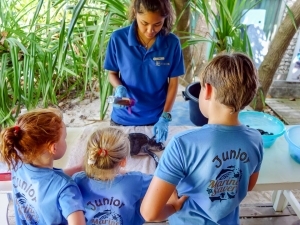 [W]e currently have 13 turtles in our head start programme at Kuda Huraa – 12 Green turtles and 1 Hawksbill. 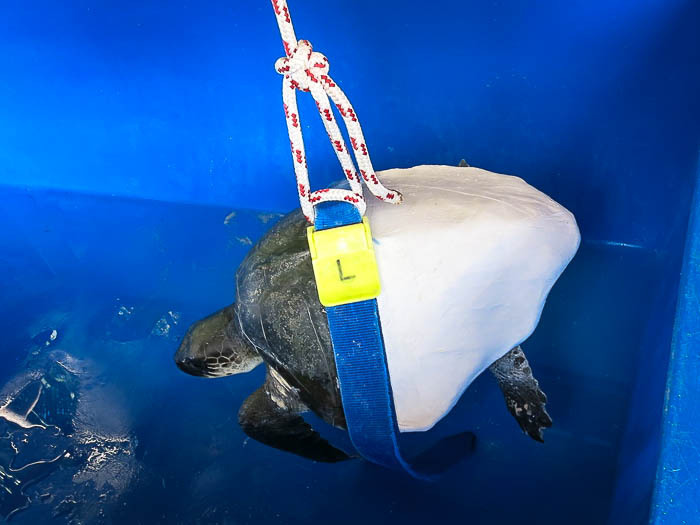 Unfortunately this month we saw several turtles suffering from a condition known as “grey patch disease”. 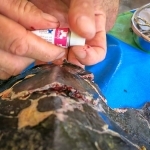 Following discussion with overseas veterinary scientists, we discovered that this is caused by a virus and is very contagious between turtles. We immediately isolated all six infected individuals and started a programme of intensive health treatment and rigorous cleaning. After two weeks the infected individuals were showing considerable signs of improvement, and the grey patch disease has all but disappeared. 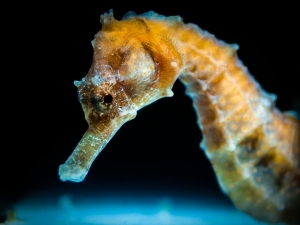 This virus may have been triggered by changes in water temperature in our pools, or by the stresses associated with rearing hatchlings in captivity (which will always be a compromise to the freedoms found in the open ocean). 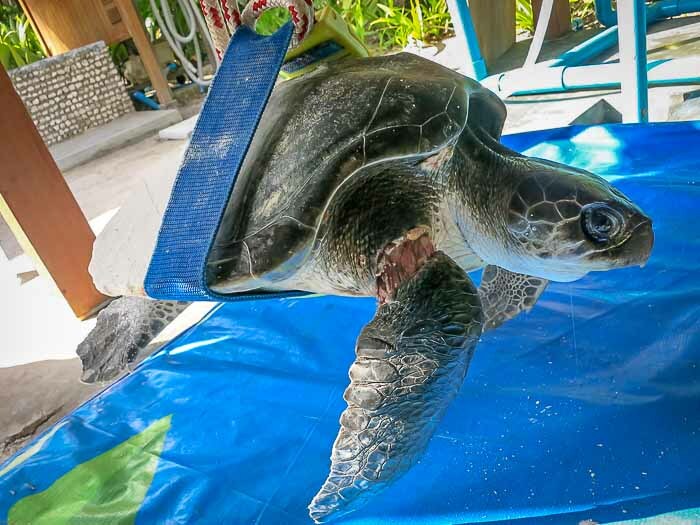 Elsa is our resident Olive Ridley with the missing front flippers, and we continue to care for her at our Kuda Huraa centre. We see her most mornings on the bottom of the pool foraging for food, but when we have attempted to release her back into the sea she makes no efforts to submerge. This is most likely due to the stress associated with transportation, so we are unsure if we will ever be able to successfully release her. We have three turtles at our rehabilitation centre here at Landaa Giraavaru, all currently sharing our large recovery pool. 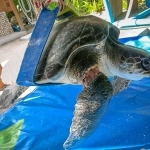 Ossy was found on 22 August, entangled in a ghost net close to the island of Madhirivaadhoo. 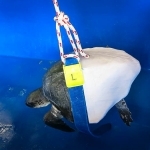 She still suffers from buoyancy problems and is not yet diving down to the bottom of the pool – an essential ability to regain before her release. 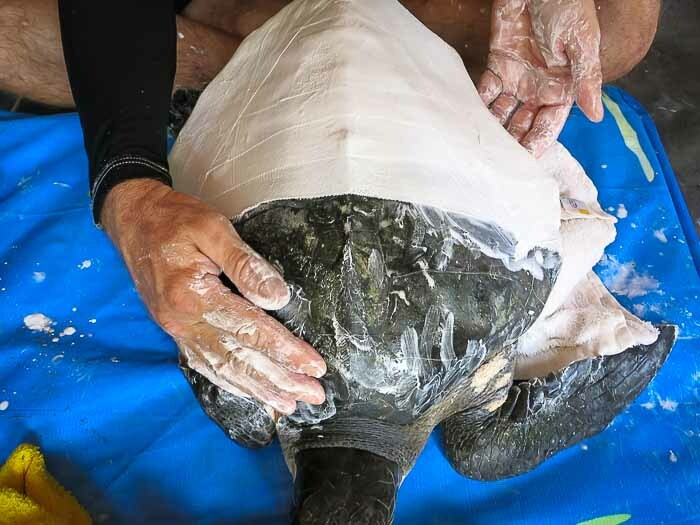 Naushad is making progress with her injury to both left flippers, and is making an effort to dive during feeding time. 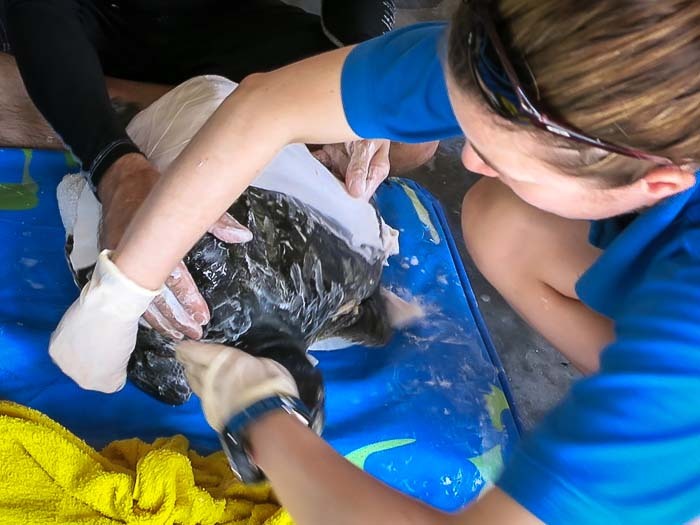 She does not resist being pushed down to the bottom of the pool and we are helping to strengthen her swimming stroke and her ability to dive after food. Zahiya is our long-term resident, but we do not have the expertise to treat her chronic health problems and house her permanently. 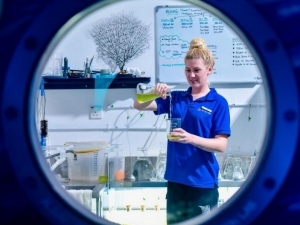 We are communicating with an aquarium supplier in the UK about the possibility of an overseas transfer where she could live out the rest of her life comfortably in a specialised aquarium. 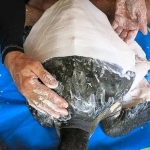 Pete was brought to us on 23 January by the Marine Biologist at Cheval Blanc Randheli, in Noonu atoll. The juvenile Olive Ridley was the smallest we have seen at our rehabilitation centre at only 39cm carapace length. 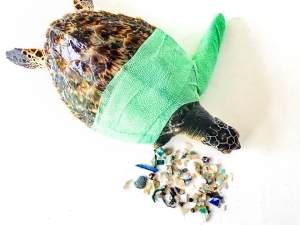 The turtle had been entangled in a ghost net and was then unfortunately hit by a boat propeller, suffering severe injuries. 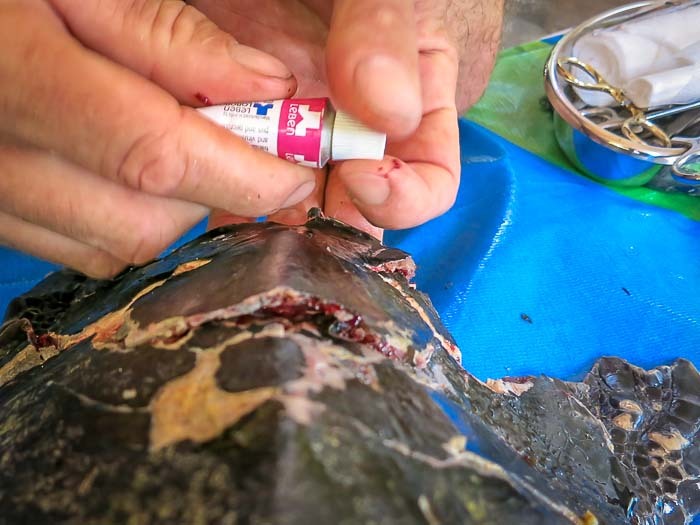 We immediately sought expert advice from our French and Réunion Island veterinary contacts, but despite our best efforts at treating the wounds and plastering the shattered carapace, Pete sadly died overnight. 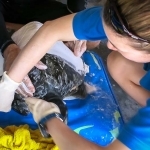 Thankfully, this is only the second Olive Ridley that has died in our care. Bless you for all your work in saving these wonderful creatures. Thank you for your kind words, Karen.